I’m the skipper for today. I need to practice steering and handling the boat at locks because after tomorrow afternoon, me and Lawrance are on our own. So Lawrance does the locks. Everything goes fine, Stanthorne Lock, Wardle Lock. 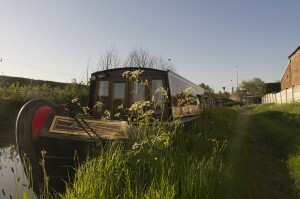 And while Lawrance is still on shore, after doing Wardle Lock, I have to turn left towards Northwich. It is extremely windy, today, and as soon as I’m out of the Middlewich Branch the wind from the left catches the boat, and, instead of the boat turning left, the wind moves the entire boat sideways. Nothing I can do. We stop for the night at Broken Cross. There is a pub (the Old Broken Cross), next to bridge 184. We moor on the tow path and head for the pub.